Local history legend Jack Harrington passed away on Sunday, May 14, at age 97. 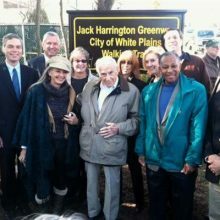 As a tireless advocate of preservation and conservation (historical and environmental), Harrington knew more about White Plains than just about anybody. To learn more about his life and legacy, check out his oral histories on our website or contact the White Plains Historical Society. Tags: conservation, greenway, jack harrington, local-history, oral history, People & Stories, preservation, white plains historical society, and white plains history. Categories: History and Oral History. Tags: conservation, good counsel, greenway, jack harrington, local-history, oral history, People & Stories, preservation, purdy house, Urban Renewal, white plains historical society, and white plains history.